Jakub is the Director of Technology and has over 12 years of experience in building applications. Before jumping into software development he was a student of Computer Science at the Cracow University of Technology. He also studied Internet Marketing at the Warsaw School of Economics. 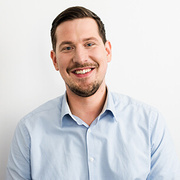 Jakub has successfully designed, provided technical leadership and coded many software solutions in a variety of industries; energy, mobile banking, computational biology, agriculture, lifestyle and automated retail kiosks to name just a few. While he lives and breathes technology, he is strongly convinced that technology never comes first - it should always follow the client’s business goals. As a new father of 2 he spends most of his free time exploring the joys of parenthood and is proud to have reached the master level in diaper changing. Sometimes he looks back with nostalgia to the times when he had more time to pursue his old hobbies, such as travelling and cooking.